12. Is this a good excercise for a persons eyes - is sthis something that would be good to help preserve your eyesight? 17. fantastic program...many thanks for sharing this program br can I change or create stretch and cutting back ground? 27. Is it good for health or not? 35. the code changes when you refresh the page so there is not only one code. 42. I m about to finish my work on a 3D Ascii Pong game for iPad I d love to get in contact with you. Here is my junk e-mail address since I don t want to post my primary on an open site: cold_soul79078@yahoo.com br br You can download a version of it for Mac at http://digitaldiscrepancy.com/3DAsciiPong.zip br br I ll port it to windows soon the stereogram generator code was written in C.
44. 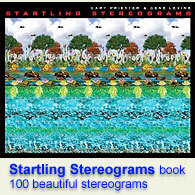 These are the best stereograms I ve ever seen. The texture / pattern is beautifully integrated into the composition. 46. The score submission for Tetris doesn t work anymore. Please fix it! 52. I love these things! How is it that no one else I show these to can see them? I have no problem with them. Anyone else have this problem with your friends? They all think I am crazy! 54. 非 常 漂 亮 的 三 维 立 体 画 中 国 人 一 样 喜 欢 的 。 哈 哈 !! 55. Very beautiful three-dimensional picture of the Chinese people like the same. ha-ha!! 57. 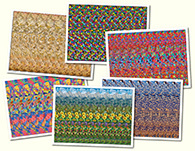 I would like to learn how to make stereograms. Can you help? 62. Pass on the Torch of Consciousness.